Not to be taken lightly, their music is a fusion of the best of ‘70s and ‘90s hard and alternative rock. Brothers Lorenzo and Filippo Spano, along with bandmates Marco Formosa, Alessandro Beltrame and Marco Mantini, have created a real rock sound. Heavy without being alienating, with songs you can bang your head to, sing along with, and feel in your bones, they craft dynamic rock that is a testament to their songwriting skill. 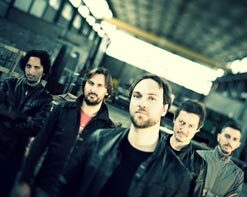 The band’s roots extend back to a time when Lorenzo, Filippo, Marco Formosa and Marco Mantini played in Black Dog, a rock act that performed in small venues around their hometown in central Italy. Before breaking up, that group recorded a demo that included songs that would later resurface as albums cuts on MMM’s self-titled debut. In 2007 Filippo met Tony Olmos, a guitarist from San Diego with a passion for rock and blues, who had a band called Rosewood 5. The following year, Filippo, his brother Lorenzo and Tony were invited to play at the Ensenada Blues and Rock Festival in Mexico. They were invited to play in Mexico again in 2009, this time with guitarist Marco Formosa in tow. That same year Mother Mary Mood was formed. In 2010, the band headed to California and Nevada for a small tour, playing gigs in San Diego, Los Angeles and in Las Vegas at the Wasted Space Club inside the Hard Rock Hotel. They eventually released their self-titled debut in 2011, on Italian independent label Alfa Music – Pop & Roll. That year, MMM were selected by Sony Music as one of the ten finalist bands for the Rock in IdRHO contest, fighting for a chance to open for Foo Fighters in Milan. 2012 saw them invited again to perform at the Ensenada Rock and Blues Fest, this time as Mother Mary Mood. At the beginning of 2013 MMM began recording Awakening. They also headed back to the States to play additional gigs in San Diego and L.A. at classic venues like Brick by Brick and The Whisky a Go Go. During their stay in California they filmed the video for “Legion” a song they slated as the first single from their upcoming release. The video found success on BlankTV’s YouTube channel. The recording of Awakening was completed in May of 2014. The band went right into filming the video for second single “Swamp Fever.” The song had been selected for inclusion on the soundtrack of the independent movie South of 8, written and directed by the band’s good friend Tony Olmos. Because of this, the video for “Swamp Fever” contains action scenes grabbed from the upcoming movie. For more information on Mother Mary Mood please contact Andy Gesner and the HIP Video Promo crew at (732)-613-1779 or email us at info@HIPVideoPromo.com . You can also visit www.MotherMaryMood.com/ for more info.